Nationwide Network of Process Servers Use one of our professionally screened process servers today! We are a one-stop shop for all of your process serving needs. 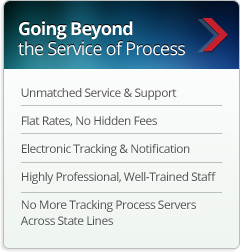 That’s right, no more tracking process servers across state-lines or dealing with multiple companies. With over 1,600 process servers nationwide, Writ Legal has the logistics in place to personally handle your service of process any where in the Continental United States at one flat affordable rate! From our simple skip-trace to our smart skip-trace, our unique style of research and experience yields comprehensive and accurate results at a competitively low flat rate! Going Beyond the Service of Process with our unmatched customer service! Live staff available 6 days a week with 24/7 customer care! Flat rate process serving guaranteed! No milage, trip, gas, toll, or hourly fees! Our Mission is to set new standards for convenience and customer care in the process serving industry which is not typically known for such ideals. From Maine to Louisiana, from New York to California and every where in between our process servers are ready to serve for you! We are a true nationwide process serving company. Writ Legal exemplifies a technologically proficient legal support services company that places a strong emphasis on customer service like no other. We aim to be the most trusted and professional company for those seeking legal support services nationwide. Our mission is to set new standards for convenience and customer care in an industry not typically known for such ideals. We achieve this through a progressive approach that emphasizes modernization of legal support services in this digital age.